MOMO�s History stems back to the 1960s. These were the years of amazing racing, just 11 years after the birth of Formula 1, with cars that must be driven with the heart and just the head. Car electronics were only fiction at this time and steering wheels were just a generic piece of the interior. However, in 1964 gentleman driver Gianpiero Moretti developed a small leather steering wheel with a much larger grip: the first MOMO steering wheel. Formula 1 driver John Surtees saw this steering wheel and asked for one just like it for his car. He went on to win the championship that year with a MOMO steering wheel in hand. And that was just the beginning. On the race track, MOMO finds a unique technological and qualitative testing ground to check the total security of its products. The MOMO Racing Department was created to provide the most advanced technology and safety to drivers and teams with tailor-made fireproof products. Product development stems from the direct experience of the MOMO teams in the top American / European race series and the hundreds of victories won with MOMO products worldwide. Every product is specifically designed by MOMO �style centre�, in compliance with the international homologation rules. At the beginning, MOMO's production was limited to the racing world, but in the 1970s, the Company started broadening its horizons by developing new product lines. MOMO thus started the production of light alloy wheels and steering wheels for road cars, both for the aftermarket sector and supplying original equipment auto manufactures, starting with Ferrari. At the end of the 1980s, MOMO signed a cooperation�s agreement with Rolls-Royce to be their original equipment supplier and later on, many other car manufacturers followed suit: Aston Martin, Citr�en, Daihatsu, Fiat, Honda, Isuzu, Mazda, Mitsubishi, Nissan, Opel, Porsche, Peugeot, Renault, Saab, Subaru, Suzuki, Toyota, Volkswagen and Volvo. Since 2005 MOMO has been head-quartered in Milan, Italy with a subsidiary in the US, MOMO USA. MOMO products are sold for the aftermarket and motor racing in over sixty countries, mainly through distributors and dealers all over the world, under the brands "MOMO" and "MOMO Corse". MOMO is still predominantly focused on light alloy road wheels, but the Company has brilliantly carried on the business of developing innovative racing products, incorporating ambitious technological goals and continuing to improve the quality, the safety and the superior design of MOMO products. The MOMO brand continues to be inspired by simple yet very strong values: product quality, superior craftsmanship, maximum safety standards and the highest performance levels. Design, advanced technology, quality and an exclusive image: these elements have always been the secrets of this successful Italian company, famous all over the world, MOMO. 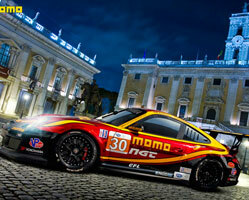 More than 50 years of MOMO racing history gave rise to the current official teams. In the US, the top team MOMO NGT Motorsport has collected numerous successes with Porsche 911 and Ferrari 458 GT3 Italia to date, in the IMSA and Pirelli world challenge Championships, also participating with excellent results to the famous 24 Hours of Daytona and 12 Hours of Sebring. 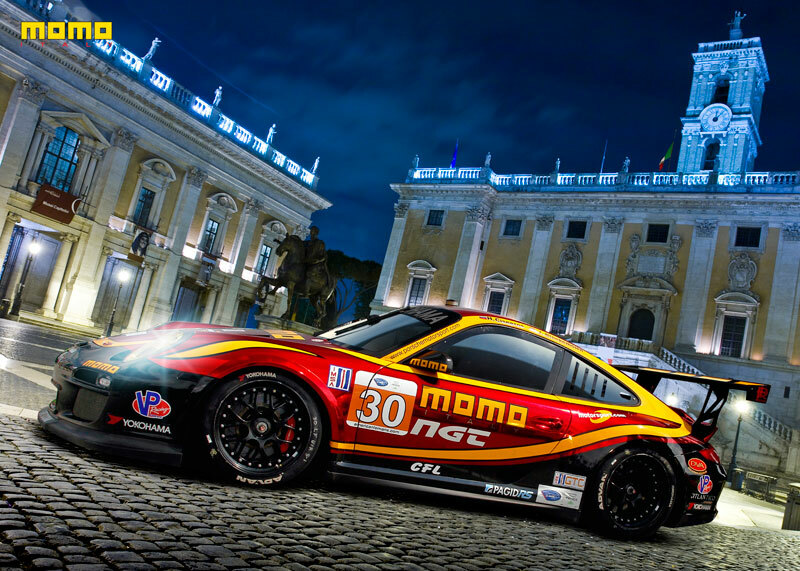 In Europe and Asia, the colors of MOMO have been represented by MOMO Megatron, which, in recent years, has competed in the Porsche Supercup Championship, and by MOMO Race Performance, in the Le Mans Series, including the prestigious 24 Hours of Le Mans in 2016. To ensure maximum safety and reliability of MOMO products, the official Teams are actively involved in the test program of the products, before their market launch all over the world. Since the beginning, MOMO has been a marketing pioneer. 50 years ago, when the modern concepts of advertising and business communication were just something more than a definition, MOMO was already approaching the market in innovative fashion. The logo itself follows a geometric design and has become an icon that is recognizable amongst popular brands in every field. MOMO�s philosophy has always been focused on products combining safety and performance with a high level of craftsmanship and innovative design. MOMO�s prestigious brand value is also due to an accurate marketing and communication strategy, prevailing in the company through 5 decades of activity. The next future will be rich of new surprises, always keeping the brand a step ahead. The innovation capability of MOMO also reflects on the IT tools the company offers to its customers. Starting from the website, a portal rich in contents, but easy to use, thanks to the accurate �ergonomics� studies and to the most searched information analysis. To find the perfect product for your car and to know exactly where to buy it has never been so simple! MOMO is also social !! The MOMO and MOMO Motorsport Facebook , Instagram and Twitter pages are the avenues to communicate and comment the latest MOMO news directly with MOMO. The MOMO youtube official channel is also available, featuring all the best videos from MOMO. SAI MAG WHEELS is the official distributor of MOMO products in India. MOMO products can be purchased online through http://www.alloywheelsindia.com. Easy EMI option is available on the website; customers can spread the cost of MOMO products from 3 to 24 months. MOMO products are also available through a carefully selected authorized dealer network. If you don�t see the MOMO ITALY OFFICIAL STORE seal, then it is not an authorized dealer. Only products purchased from a MOMO authorized dealer qualify for the manufacturer�s warranty & are backed by outstanding customer service through our authorized dealer network. MOMO products come with a warranty card. Warranty is valid for normal intended use for a period of 12 months from the date of purchase.